Denmark is connected to the European continent with Germany in the south - and the kingdom is surrounded by its nearest neighbours Sweden and Norway. Together Sweden - Norway - Finland - Iceland - Faroe Islands and Denmark - are all Nordic Nations belonging to the Northern Regions that is considered as a part of Scandinavia - and also called the Nordic Countries - as well as the Nordic Welfare States. 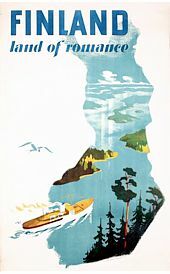 Nostalgic & Vintage Tourism Posters promoting Scandinavian Nations. Sweden and Norway - "Brother Countries"
and is an equal part of the Scandinavian countries. The southern Swedish province - "Skåne" - belonged to Denmark until 1659 - when the peace treaty was signed at Roskilde. The transition to Sweden was later confirmed by the Treaty of Copenhagen 1660. The Danish attempt to retake the province failed in 1710. Since - the Oresund Bridge has linked Sweden and Denmark closer together - and formed a new transnational region in northern Europe - as the main important hub for economic and cross-border activities in Scandinavia - with focus on the cities of Malmö and Copenhagen. 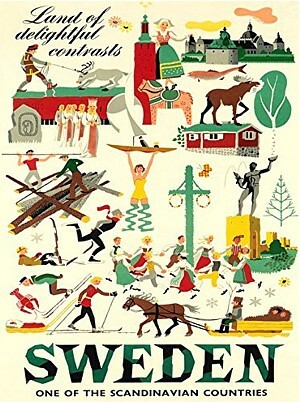 Nostalgic & Vintage Tourism Poster promoting Sweden. Norway was a part of Denmark until 1814 - when Denmark went bankrupt and had to cede Norway to Sweden. 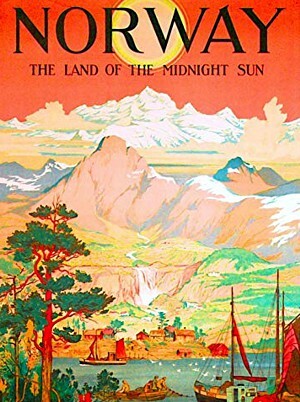 Norway took this opportunity to declare independence - and a peaceful separation in 1905 of Norway from Sweden - plus a brotherly settlement was a reality - which later led to the union of five Nordic countries in the region called Scandinavia. The Norwegians elected the Danish prince Carl of Denmark and Iceland as King - who took the name King Haakon VII - and reigned from 1905 to 1957 - as a very popular sovereign. 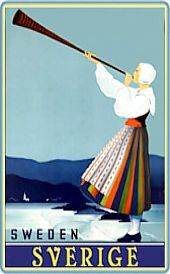 Nostalgic & Vintage Tourism Poster promoting Norway. Part of the Scandinavian Landscape. Queen Margrethe I of Denmark gave birth to Scandinavia - as Nordic United Nations - which included five Nordic countries that all have turned into the well-known Nordic Welfare States. The Finns more than thousand year old Sauna and Wellness Culture has been spread all over the Scandinavia Countries - and been adopted widely by the Scandinavians - as a hot and steaming place for mental relaxation and stimulated healing - and where Scandinavian gender equality is practiced to its full extent. 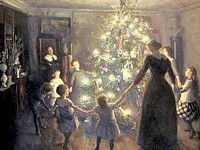 All Scandinavian Countries celebrate Christmas and the following holy holidays with family and friends. Painting by Viggo Johansen - 1891. 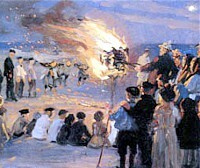 Midsummer is celebrated traditionally all over Scandinavia with different cultural traditions - and especially in Denmark with bonfires - speeches and songs. A great tradition in Denmark by the sparkling bonfire - is to sing “Midsommervisen” - the Midsummer Hymn by Holger Drachmann - “Vi elsker vort land”. We love our Country. 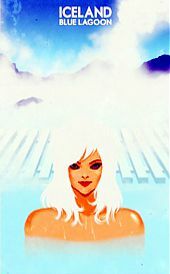 Painting by P.S. Krøyer - 1851. Cruising around to Scandinavian countries and visiting the Nordic capitals by the beautiful waterways and alongside the picturesque coastlines of Scandinavia - has become a spellbinding and popular adventure with numerous scenic experiences and fascinating voyages. 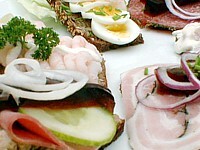 The legendary and traditional "Smørrebrød" - Open faced Sandwich" with "Snaps and foamy Beer - is one of the Scandinavians favourite treat and a major part of the Scandinavians Food & Drinking Culture. 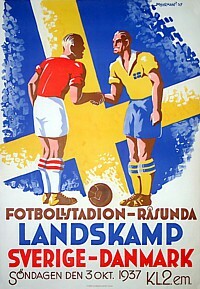 Nostalgic & Vintage Poster from 1937 - announcing the football match and national competition between Sweden and Denmark. Many Nordic and Scandinavian names originate from the Viking Age and are a vital part of the Norse Mythology and Viking Cultural Heritage. Denmark often calls Sweden and Norway for their "brother country" (Broderland - Nordic term) - as the Danes have much in common with the Swedes and Norwegians - such as the language - customs - religion - culture - mentality - gender equality - combined with millenary history and inheritance - which has been formed and cultivated during multiple generations. And most of all - the very close Nordic relations and cultural interactions between three other Scandinavian Countries - Finland - Iceland and Faroes - who are also considered as a respected part of the Scandinavian Nations - and form together with Denmark - Sweden and Norway the entire Nordic Countries - that all are admirable and exemplary Welfare States with the maximum priority of offering all citizens social and economic well-being - and the highest quality of life - supported by a second to none healthcare system with full medical coverage - living standards - housing conditions - great educational possibilities - effective infrastructure - paradisal environments - as well as numerous other public and financial benefits based on the core values and ideals of all the well-functioning and well-organised Scandinavian Democracies - which is deeply rooted in thousands years of Nordic Viking inheritance - Nordic history and Nordic culture. 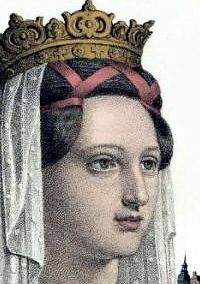 Queen Margrethe 1 (1353–1412) was the first female monarch of Denmark actually the first sovereign that united the Nordic Kingdoms Denmark - Norway and Sweden from around 1363 to 1380 - and was the founder of the Kalmar Union from 1397 to 1523 - which was the foundation of Scandinavia - that later included Finland and other Northern Isles including Iceland - Faroe Islands and Greenland. Queen Margrethe 1 - was the daughter of Danish King Valdemar IV (Kong Valdemar Atterdag) and married King Haakon VI of Norway and Sweden - who was the son of King Magnus IV of Sweden - Norway and Scania. (Skåne - Southern Sweden) The Kalmar Union was suspended - when Sweden rebelled and became independent on 6 June 1523. (Kalmar is a city in the southeastern part of Sweden - situated by the Baltic Sea - and founded in the 11th century) Queen Margrethe 1 is buried in Roskilde Cathedral - behind the High Altar - as the first Danish Royalty entombed in Roskilde Cathedral. The southern Swedish province - "Skåne" - belonged to Denmark until 1659 - when the peace treaty was signed at Roskilde. The transition to Sweden was later confirmed by the Treaty of Copenhagen 1660. Norway was a part of Denmark until 1814 - when Denmark went bankrupt and had to cede Norway to Sweden. 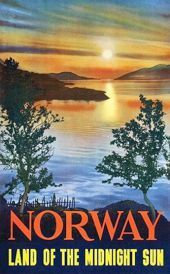 Norway took this opportunity to declare independence - and a peaceful separation in 1905 - between Norway and Sweden was confirmed. The Norwegians selected Danish Prince Carl of Denmark as their new King. He took the royal name King Haakon VII. Scandinavia - or the Nordic Countries is a Nordic Union formed in the late 19th century - and is an alliance between Norway - Sweden - Finland - Iceland - Faroes and Denmark - allowing free movement across borders without passports for the Nordic countries' citizens - and are regular and comprehensive trading partners with substantial cross-border export activities between the lucrative Scandinavian markets - as well as being a strong Historical and Cultural region in Northern Europe. All the Nordic Nations has a well-established and praiseworthy welfare system - created through numerous generations - and covers the core essences of deep-rooted Cultural Heritage - Civilisation - Christianity - Mutual Confidence - Democracy - Stability - Capitalism - Trustworthy Culture and High Standard of Living - which mainly are these fundamental Values and Nordic Ideals all the Nordic Welfare States are solidly based and built on. The Scandinavians just adore their four captivating seasons - which all charmingly and contrastingly variate from country to country - and each with their own special winter - spring - summer and autumn season with different weather and climate conditions. The traditional Christian Holydays that are celebrated blissfully and gracefully as public holidays all around in Scandinavia are Christmas - Easter - Ascension Day - Whitsun - and a special Great Prayer Day in Denmark. And all Scandinavian Countries celebrate their own All Saints' Day - National Day and Constitutional Day - which are holydays and holidays in some Scandinavian countries. Especially - the Scandinavians look forward to the warm summer season - where mainly the midsummer traditions and summer solstice festivities are held all over Scandinavia - and is a "must" to celebrate in different ways and with various cultural traditions and activities all over Scandinavia. The Scandinavians simply love their warm summer season that melts them up after the very cold winter months - which allows the Scandinavians to soak up a lot of sweltering sunshine before they prepare themselves comfortably by storing their resources and energy for the upcoming cold and fresh winter months with plenty of winter bathing and sauna wellness plus other winter fun activities and amusing seasonal adventures in this northern and attractive part of the world called Scandinavia. As all Scandinavian countries are surrounded by massive waters - as well as picturesque waterways with an enormous stream of fishing vessels - maritime activities and cruise traffic - and beside expressive green - flourishing and grassy pastures for raising and holding healthy livestock plus considerable areas with well cultivated and fertile bending cornfields - the Scandinavians prepare - serve and eat tremendous loads of seafood - pork - beef and other type of meat products together with loads of baked or steamed bread varieties - and the typically “open faced sandwiches” made in numerous variations. The Nordic food culture is like a grandiose meal feast and spectacular delicious treat with a huge variety of exciting and rural dishes - flavoured the Nordic way with the Scandinavians special taste preference - which is quite similar around Scandinavian regions - and mostly consumed with numerous types of alcoholic beverages - foamy brews and especially the national drink “Snaps” (Brændevin) or “Burning Wine” or Akvavit “fire water” - which also is a part of the Scandinavians Drinking Culture - and has been it since the first Viking settlers brew their first strong and thick beer (ale) and mead “mjød” with high alcohol content. Since the very first football match between Sweden and Denmark and their national team’s - there has been a great ongoing national competition among these two rival Scandinavian Nations - that gathers tremendous crowds witnessing many dramatic games trough the past. And also football fights between Norway - Sweden - Finland - Iceland and Denmark have great attention among genuine football lovers and fans - but the never ending football matches between the two close related brother countries and sports rivals Sweden and Denmark are the classic events that trill Soccer enthusiast and called the prime Nordic Football Derby. The entire Scandinavian Countries have a population of almost 30 million inhabitants with the most popular and common surnames like Andersson - Johansson - Karlsson - Nilsson - Eriksson - Larsson - Olsson - Persson - Svensson and Gustafsson in Sweden. And Korhonen - Virtanen - Nieminen - Mäkinen - Mäkelä - Hämäläinen - Laine - Koskinen - Heikkinen and Järvinen in Finland. And Hansen - Olsen - Johansen - Andersen - Larsen - Nilsen - Pedersen - Kristiansen - Jensen and Karlsen in Norway. And in Denmark Jensen - Nielsen - Hansen - Pedersen - Andersen - Christensen - Larsen - Sørensen - Rasmussen and Jørgensen. The surnames for a girl in Iceland are either related to the mother’s first name and ends with “dóttir” (which means daughter of) - and for a boy related to the father’s first name that ends with “son” (which means son of). So there are no ranking of popular surnames in Iceland. 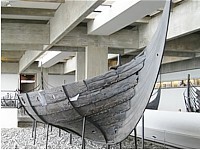 The seafaring and fearless Vikings derived from Scandinavia and mainly from Norway - Sweden and Denmark - and many Nordic names originate from the Viking Age and belong to a vital part of Norse Mythology and Viking Cultural Heritage. ... & Scandinavia - The Least Corrupt Countries on Earth! All Scandinavian Nations are ranked once again - as one of the least corrupt countries in the world - and can proudly step on top of the trustworthy victory podium plus titled as the "happiest people" in the world. 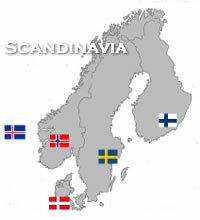 In multiple and international surveys plus studies - all five Scandinavian Nations have been awarded by having the "happiest people" in the world with a very high living standard - as well as being ranked on the entire top of the trustworthy victory podium - as some of the “least corrupt” Nations on Earth - which all Scandinavians find very natural and as being a vital part of their everlasting Cultural Heritage and National Identity. The appraisal of being the "happiest people" in the world plus remaining as the “least corrupt” nations on this wonderful planet called earth - makes the Scandinavians quite proud of living in Nordic countries with residing paradisiacal conditions based on a well-functioning welfare system with extensively welfare state proportions plus the Core Scandinavian Values - which is founded on mutual trust and confidence with one another! That’s Scandinavians - and that’s Scandinavian Ideals in a Nutshell! Sweden - is a kingdom and the largest country in Scandinavia - and Stockholm is the capital. Finland - is a republic and the second largest country in Scandinavia - and Helsingfors is the capital. 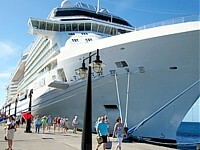 Norway - is a kingdom and the third largest country in Scandinavia - and Oslo is the capital. Iceland - is a republic and the fourth largest country in Scandinavia - and Reykjavík is the capital. Denmark - is a kingdom and the smallest country in Scandinavia - and the capital is Copenhagen. The Faroe Islands plus Greenland are a part of the Danish Kingdom. All Scandinavian Nations are depicting a Christian Cross in their National Flags - which symbolises that all Scandinavian Countries are based on a deep-rooted and predominant Christian Culture - where Christianity and Protestantism are the prevalent Religions in all of the Nordic Welfare States. From Northern Scandinavia - and directly to China - and back again! The 16 km Oresund Bridge and Tunnel that links Denmark with Sweden - Norway and Finland via Copenhagen - is one of the longest combined tunnel - road and railroad bridges in the world - that transport passengers over and under the Oresund strait. Actually - it is now possible to drive a car from the most northern borders of Scandinavia through Denmark and all the way to China - without using any type of ferry connection. There are almost 2.200 bridges connecting Denmark. This Denmark & Scandinavia Site will be updated frequently!